I took advantage of the glorious weather on Columbus Day to participate in another American Fall tradition: bulb planting ….Yes, it’s bulb planting time of year again! This is the time of year that comes after the looking at bulbs in catalogs time of year, and then the ordering bulbs time of year, which coincides with the I will have lots of energy to plant bulbs this year time of year. But, I have survived and triumphed. I planted 375 bulbs in total = 275 daffodil bulbs, and 100 pink tulip bulbs. 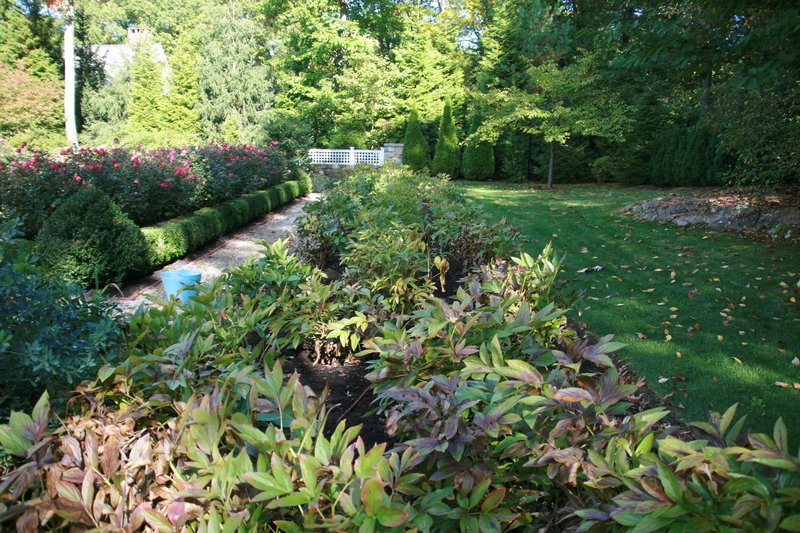 I planted all 275 daffodil bulbs amongst my longest peony border. I do love my peonies, I have lots of them, over 100, and I am always trying to add more interest to their borders for other seasons when the peonies are not in bloom. The Long Peony Border after the daffodils have been planted. You can’t see them now, but you will come spring! One of my peony borders is interplanted with Honorine Joubert Japanese anemones and so this time of year that border looks alive and flourishing with the tall stems of Honorine blooming above the spent peony foliage. Since I crave color and flowers in early spring after the long winter, I decided I wanted to add early spring flowers to the long peony border rather than summer or fall bloomers. Daffodils are such a nice choice because they will bloom and then their foliage will fade, and eventually die back, leaving the peonies to bloom on their own. I planted a mix of naturalizing daffodils: Pimpernel, Falconet, Single Campernelle, Thalia, Dutch Master, Carlton, Delibes and whatever unnamed varieties that are included in the Spring Loaded mix, all from Colorblends. I like to plant the naturalizing varieties so I am assured of daffodils for many springs to come. Keep a watch out, come spring I will fill Of Gardens with photos showing the success of my mass planting. 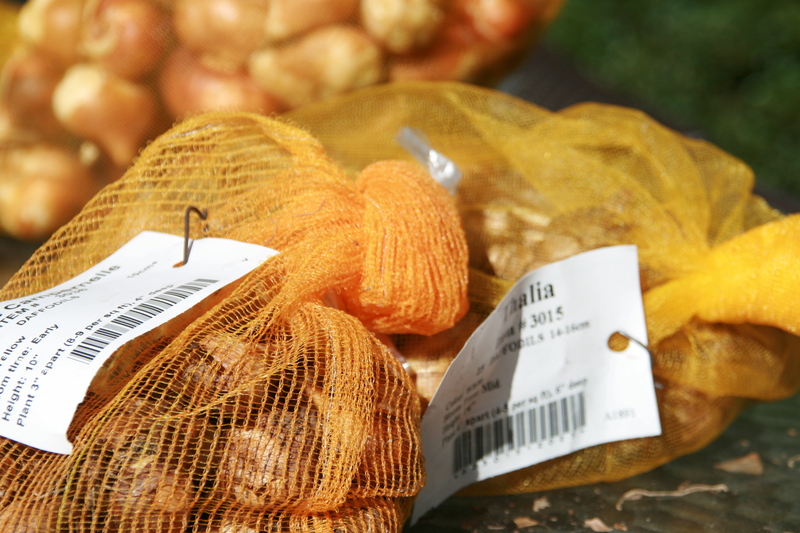 Have you planted any bulbs this fall? You have so much energy and it comes through in your writing and in the fabulous pictures of your garden. I have not planted any bulbs this year, but in prior years I planted many tulips with somewhat disappointing results. The deer ate some, then some other critters tried to eat the bulbs even though I had put mesh wire above and below them for protection. And then they mostly only produced blooms for one or two years. Do you have any suggestions that will improve my outcomes please? And talking of little critters, your photo of the box of bulbs has some sort of animal (real or stuffed, hard to tell!) in it. Looks cute though. I am afraid I don’t have any magic to getting tulips to last longer. Tulips generally only last a year, if you are lucky you might get three years from most types of tulips. The wire mesh helps from critters, but it can’t make the tulip bulbs generate more energy to keep going. Glad you look my dog, Poppy! She’s real, but small. Daffs, alliums, and squill all got planted here this autumn, won’t we both be so happy come spring! Have you ever seen the tulip species t.clusiana? They are great under peony because they are relatively short, have one of the most beautiful flowers and naturalize like crazy. I grow one called Lady Jane, but there are others ( Brent and Beckys has a few). I will try t. clusiana. Thanks for the suggestion. Last year was a big allium year for my garden. I do love them, too. I have some squill, it’s low impact in my garden, but it’s white. Maybe a stronger color would have a bigger impact. Thanks, Natalie. I look forward to spring too! you asked about Dozen for Diana? I’m choosing a plant each month, to build a virtual garden. But the chosen plants are all growing happily in my garden. Now our garden has the lush exuberance of shocking pink watsonias. Wow, a lot of bulbs planted with a delayed reward come spring-the best. I remember when I planted my first 100 daffodil bulbs so long ago-all upside down. So, that season-I planted 200! Look forward to the spring pics. I’d love to see a photo of the peony border with the anemone in bloom. Any chance of that? I’d love to share a photo of my peony and anemone border. I will have a look and see if I have one from a previous year…this year I have already cut down the peonies in that border, so only the anemones are standing. What kind of pink tulips did you plant? Also scheepers is a great resource for bulk purchases. I put in Pink Cubes tulips this year…a variety of pinks at different times. I have a weakness for pink! 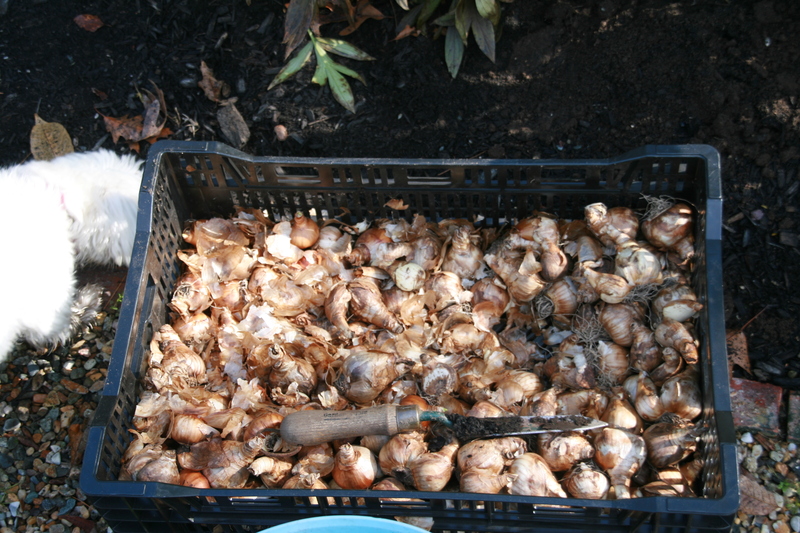 When it comes to planting bulbs I always think that more is better, at least 100 of any small bulb. I have had good luck with Darwin hybrid tulips returning year after year. I also have a yellow species tulip that returns but I can’t remember it’s name right now. I agree, more is better. I like Darwin tulips, but they are usually only one year strong performers for me. I am planting wild tulips this year to see how they perform.